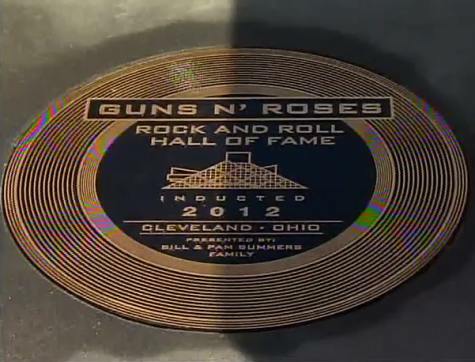 Former GUNS N’ ROSES members Slash, Duff McKagan, Steven Adler,Matt Sorum and Gilby Clarke performed three “Appetite For Destruction” songs with Myles Kennedy at the band’s Rock And Roll Hall Of Fame induction ceremony earlier tonight (Saturday, April 14) in Cleveland, Ohio. Kennedy, who handles lead vocals in Slash‘s solo band and ALTER BRIDGE, sang “Mr. 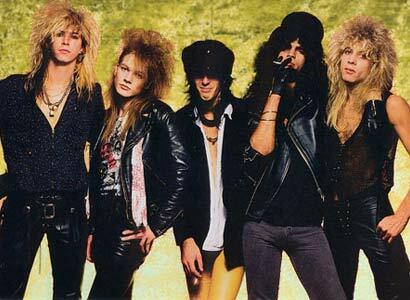 Brownstone”, “Sweet Child O’ Mine” and“Paradise City”, with “Use Your Illusion”-era member Sorum sitting behind the drum kit on “Brownstone” and the man he replaced in GN’R,Adler, pounding the skins for the other two songs. NOTE: Axl Rose was not the only one missing the event. Izzy Stradlin let know months ago not be coming to the induction! Clarke played guitar with GN’R in the 1990s but was not inducted. As for the other inductees, Chris Rock inducted the RED HOT CHILI PEPPERS, Chuck D did the honors for the BEASTIE BOYS, Bette Midlerinducted Laura Nyro, ZZ TOP was on hand for Freddie King, Carole Kinginducted Don Kirshner, John Mellencamp paid tribute to Donovan andSteve Van Zandt handled duties for the SMALL FACES/FACES. 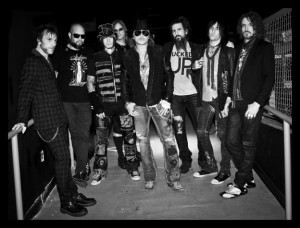 At moment Axl Rose is on tour with his new bandmates and about to rock Europe again!